Also showing at Photofusion until 27 Jan 2010 is Richard Nicholson‘s ‘Last One Out, Please Turn On The Light‘ a series of large colour prints of London’s remaining professional darkrooms begun in 2006. These highly detailed images were taken using a large format camera using an open shutter in the dark and illuminating them with a series of flash exposures. 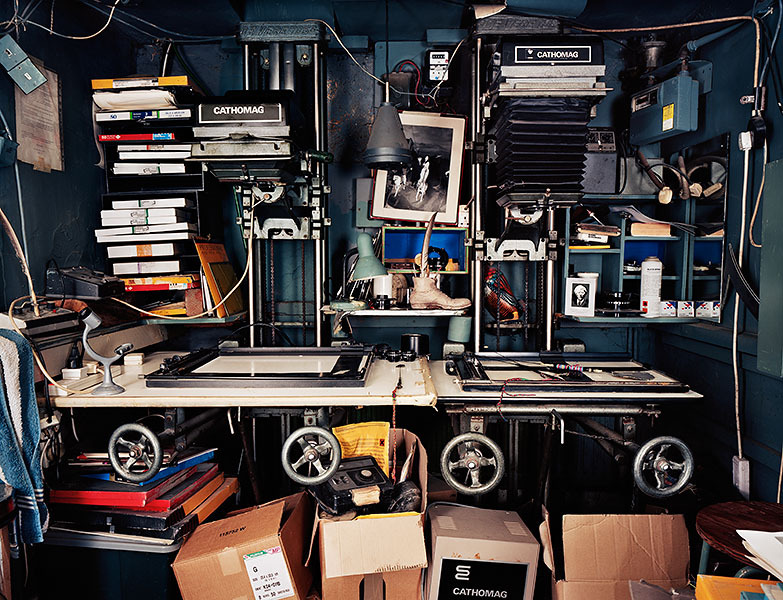 It’s a fascinating glimpse into the work areas, and although the web site describes these as “chaotic rooms marked with the patina of time  a world apart from the contemporary photographer’s shiny computer workstation” they are all much larger and rather tidier than my own darkroom. And perhaps too I’ve gone rather further into “personalising” my own un-shiny computer set up. These images will have a particular fascination for those of us who are or have been photographic printers, and for those who know the work of the printers concerned – or know them socially, but it is perhaps work for a limited audience rather than for the wider public. They were certainly attracting a great deal of attention and comment on the opening night – where quite a few of those whose darkrooms were shown were present. As one of the limited number of darkroom geeks, I would have liked also to have seen the other ends of their darkrooms – the wet side rather than just the dry bench with their sometimes magnificent enlargers. You can see more from the series on Richard Nicholson‘s web site, where you can also see examples of his portrait work and an intriguing urban landscape series of garages and pramsheds in Tower Hamlets, which are really just my kind of thing. This entry was posted on Friday, November 27th, 2009 at 12:16 pm and is filed under Photographers, Reviews etc. You can follow any responses to this entry through the RSS 2.0 feed. You can leave a response, or trackback from your own site.